I get asked A LOT about my skincare routine and I know I’ve shared it before, but I’ve also mentioned that I’m constantly testing out and trying new products. Beauty products and skincare products are fascinating to me, especially when it comes to face moisturizers! I’m super picky when it comes to choosing the right moisturizer that is hydrating, lightweight, long-lasting, non-greasy (also non-sticky and non-shiny) and is formulated with natural, healthy ingredients that isn’t super expensive. There are SO many moisturizers out there but today I wanted to share more about the one I’ve been using for about a month and why I love it so much! Back in March Vichy USA sent me a box of goodies and I first started using their cleansing makeup remover wipes (OBSESSED!!! More to come about those at a later time!) and then because I loved the wipes so much I branched out and started testing out more of their products including Mineral 89, a Hyaluronic Acid moisturizer that is lightweight, paraben-free and water based. This first caught my eye because it’s an Oprah Beauty O-Ward Winner (if Oprah loves it, I’ll love it!! Right?! haha). 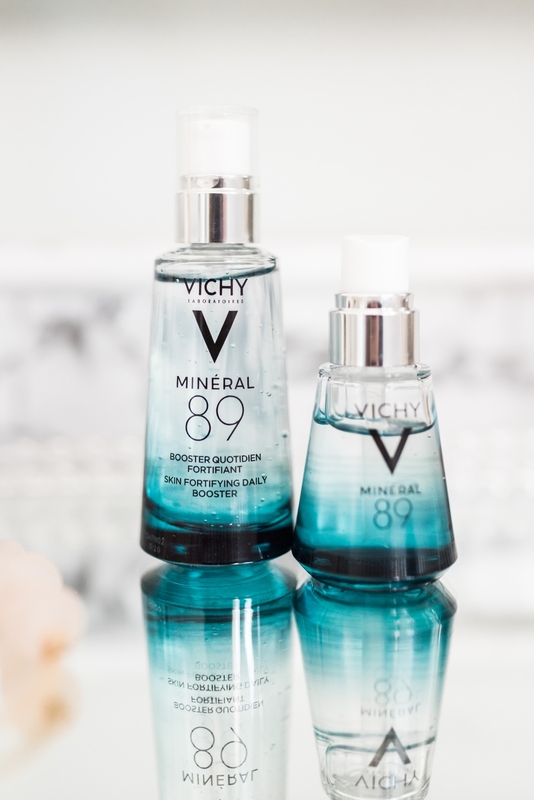 Mineral 89 contains 89% of Vichy’s miracle ingredient, Mineralizing Thermal Water, a proprietary Vichy ingredient that is scientifically proven to fortify and protect skin against daily aggressors like pollution, stress and fatigue. 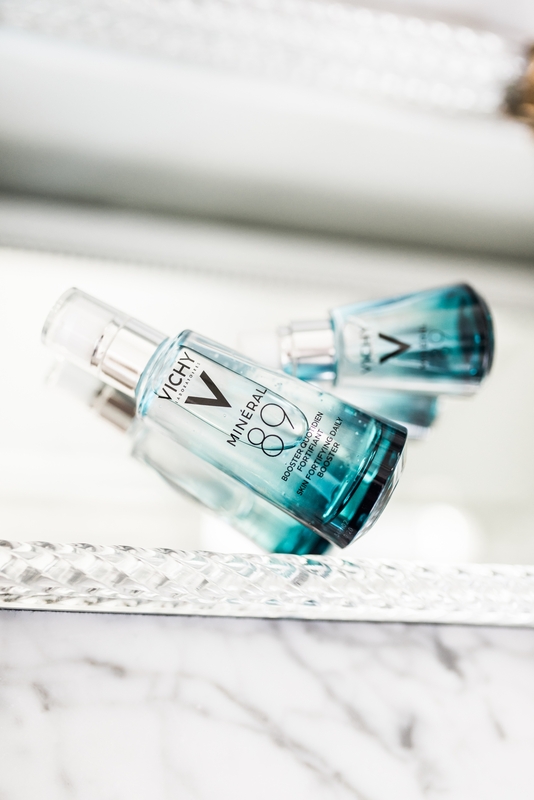 Mineral 89 also features Hyaluronic Acid which helps plump and hydrate skin. I use it twice a day, in the morning as the first step in my skincare routine and again at night before bed after cleaning my face. In the mornings, I use 2 drops before applying my foundation (sometimes I even mix the two! Do you guys mix your foundation and moisturizer?!) and it’s the perfect base for the remaining steps in my routine. Whether I’m at a photoshoot, going on a run or at home with my kids I need a moisturizer that gives me a hydrating boost that lasts all day long. Mineral 89 is definitely a must-have product that I’ll be using all summer long, especially before applying my sunscreen when I’m at the pool with my kids (Vichy even has a travel size Mineral 89 that is perfect for on-the-go)! My face truly looks and feels brighter and hydrated since using this product, in fact, when I first started using it I remember Isla Rose saying “mama, you look pretty!! !” Melts my heart! Now through the end of the year, use my code RACH18 to get 20% off and free shipping on all orders. Click here to purchase your own Mineral 89 and let me know what you think of it!! Brought to you by Vichy. Very nice product feAtured! ???? Thanks for sharing Rach! Def would like to try these products! You should!!! I love them both!! i looked up your recent blog post of VICHY. I SAW THAT YOU LIKE THE WIPES HOWEVER I TRY TO STAY AWAY FROM PRODUCTS WITH PROPOLYNE GLYCOL. IS THERE A DIFFERENCT WIPE THAT YOU WOULD SUGGEST THAT YOU LIKE AS WELL? THANKS!! Vichy is such a beautiful brand. I’m so happy it’s much more readily available in the states! Me too!!! I also love how affordable they are!! Me too!! These are some of my favorites!! Love Vichy products! love your reviews of products + i think i need to try these! Thank you so much!!! You definitely need to try them!!! I keep hearing good things about this brand. Thanks for sharing your review. I am so trying out that product – it sounds amazing!